Single Story 3BR * Like New & Highly Upgraded * 55+ Senior Community . . . Located on a lush greenbelt in the desirable community of The Groves, a 72-acre development, this exceptional âmove-in perfectâ patio home boasts recent improvements that include two bathrooms with new tile work, fresh interior and exterior paint, a new central air and heating unit, crown moldings, custom baseboards, a new roof, all new landscaping and a brand new sprinkler system. 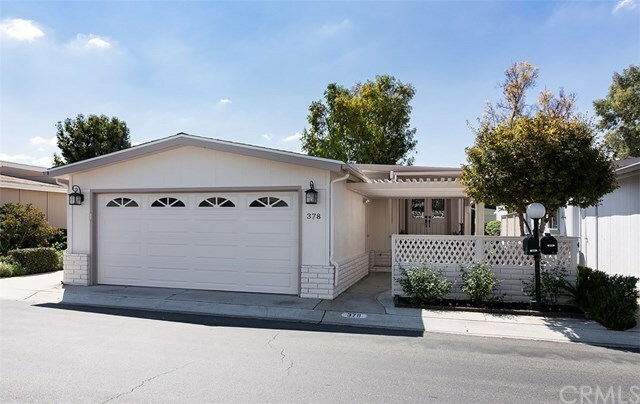 Encompassing 1,732 square feet on one level the home features spacious living areas and other extensive remodeling over the past five years that includes a new kitchen, dual pane windows and water heater. In addition, the property has an enclosed two car garage with finished walls and fruit bearing trees that include oranges, limes and grapefruit. The purchase of the home includes a washer and dryer for the indoor laundry. Pride of ownership abounds within this lovely development that offers an association clubhouse perfect for hosting special events. The property is also within close proximity to wonderful community shopping, dining and entertainment experiences, and all area schools. For those seeking an environment of complete comfort in a setting that is both picturesque and easy to maintain this home is truly ideal. Directions: North of 5 fwy, Jeffrey and Irvine Blvd.